Happy New Year's Eve friends. Before we ring in 2018, I wanted to share some of my favorite books of 2017. This year I read 57 books, and according to my Goodreads rankings, I only had a handful of true favorites. Those favorites were all fiction books. Overall I read a ton more fiction in 2017 because I needed an escape from the real world. So here are the books I gave five-star reviews in 2017. Kristen Hannah tells an amazing story and though this book was nearly 500 pages, I couldn't put it down and by the end I was sobbing. Firefly Lane tells the story of two best friends from when they meet in the 70s as middle schoolers and follows them through their lives through into the early 2000s. Each section of the book is broken down by decade and both characters just felt so rich and real. This was one of the best books I've read so far this year. Chapters alternate being telling a fictional story of how Jane Austen came to write some of her most famous books and telling the modern day mystery of the origins of the first draft of one of those books. While I did find the ending to be a tiny bit predictable in the mystery part, this book was a perfect read. I loved the characters and didn't want the story to end. Holy crap was this book good. Not only did it have the twists and turns one would expect from a typical crime novel, but it also carried the plot line of the first group of black police officers established in Atlanta in 1948. This group of officers had very limited power, and when two of them find the body of a dead black woman, who was last seen with a white man, they aren't allowed to investigate the case. It's instead turned over to white detectives. Being in the deep South during that time period, you can probably imagine how well that went. This book was excellent as a piece of historical fiction, but I also found the parallels with what's going on today between police forces and black citizens to be particularly striking. Loved this classic book, and the crazy terrifying world it portrayed. It's really interesting reading it in light of all that's currently going on politically, and that's all I'm going to say about that. This was an awesome book that I couldn't put down. I read most of it in one night and was captivated by the inner workings of the Plumb family. Have a suspicion this will be one of my favorite books of 2017. And here's my runner-up -- receiving a four-star Goodreads review. After loving the Martian so much, I was eagerly looking forward to Andy Weir's second novel. Artemis brought back all my favorite things about Weir's writing -- a sassy narrator who pauses for asides to make sure the reader is clued in to what is actually happening or as is often the case to make sure the reader understands her sarcasm, a fast-moving plot, and all the twists and turns of action taking place in almost-zero gravity. If you liked the Martian, you'll like this follow-up novel that takes place on the surface of the moon. 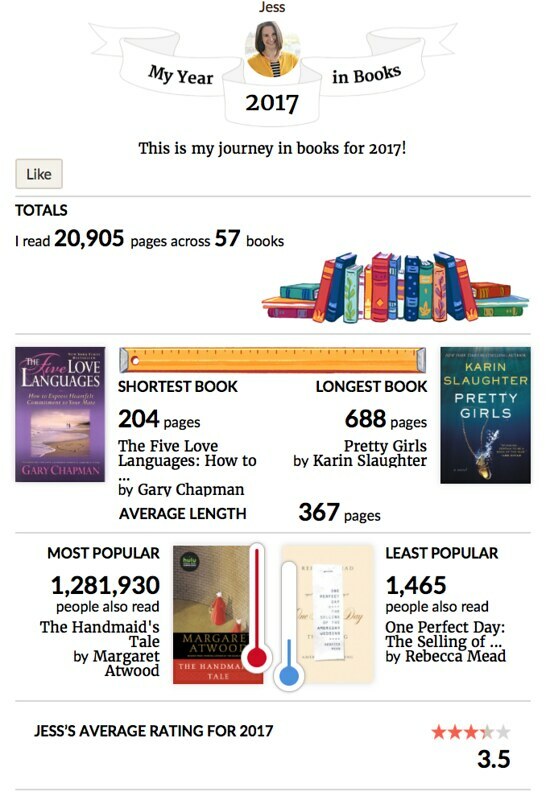 If you're curious about what else I read and liked (or didn't like) in 2017, you can check out this nice round-up on Goodreads. What's on your reading list for 2018? I always love adding new books to the "to-read" pile.